Like its name suggests, resembles an acorn in shape; has dark green ridged skin on the outside, and deep yellowish orange flesh on the inside. 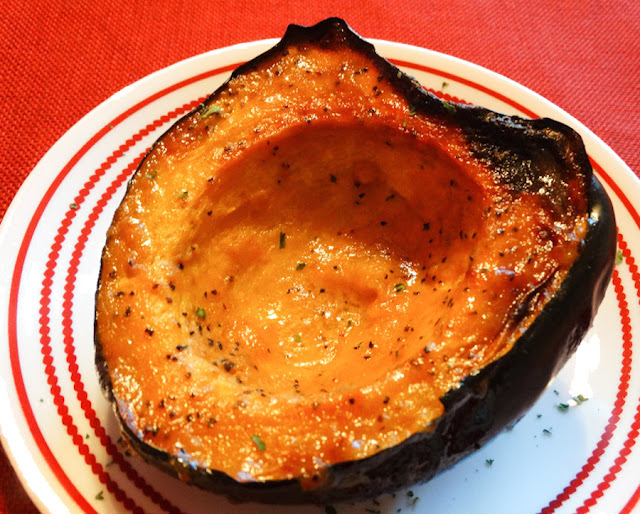 It is a great winter squash for roasting, with this recipe complementing it deliciously. After preparing the squash, fill the cavity with a blend of butter, honey and Dijon mustard, then slide it into the oven for a great side-dish to accompany turkey, ham, chicken, or roast goose. There you have it ~ a delicious single-serving bowl for everyone around your table! Cut off stem from squash, set squash on its side and cut in half vertically. Scrape out seeds and stringy material from the cavity, with a large spoon. Mix butter, mustard, honey, and salt and pepper in a small bowl until blended. 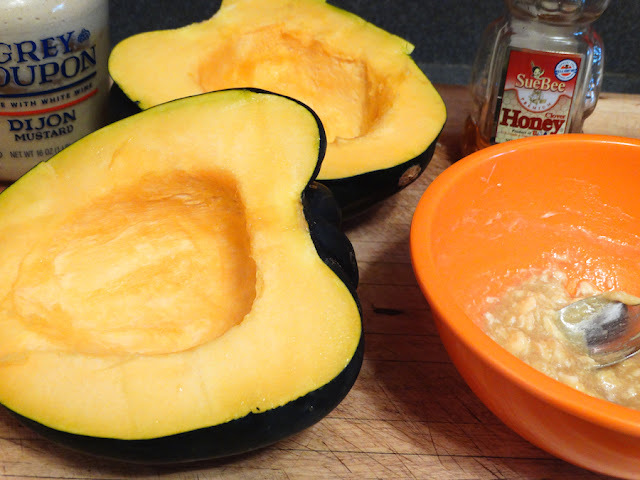 Fill each squash cavity with 2 tablespoons of butter mixture. Bake until squash is tender, 1 hour to 1½ hours. Tastied up, that’s what this great dish is! It’s simply a big bowl of pasta tossed with sautéed chicken bites, fresh basil, sweet cherry tomatoes, and cubed mozzarella. It’s all about the mozzarella chunks, melting when they come in contact with the hot pasta and chicken ~ that’s what makes the dish so delicious. If you’ve got a lot of those glorious end-of-summer tomatoes in your garden, this is the recipe for you, thanks to The Skinnytaste Cookbook. Give it a try, it’s a favorite of ours! Heat a large non-stick skillet over high heat. Season the chicken with the dried basil, salt and pepper. Spray skillet with cooking spray, add chicken. Cook until chicken is cooked through, about 3 minutes on each side. Cook pasta to al dente according to package directions, drain, reserving about ½ cup of the pasta water. Meanwhile, increase the heat under the skillet to high, add oil and garlic, cook, stirring just until golden. Add tomatoes, salt and pepper to taste, reduce heat to medium-low. Cook, stirring, until tomatoes become tender, 5-6 minutes. Add pasta to the tomatoes; if too dry, add some of the reserved pasta water. Remove pan from heat, stir in fresh basil and cheese, and serve hot. I love potatoes, any variety, don’t you? They’re filled with minerals and vitamins, and are the ultimate comfort food for me. That is, unless they involve soup, no potatoes in any kind of soup for me! 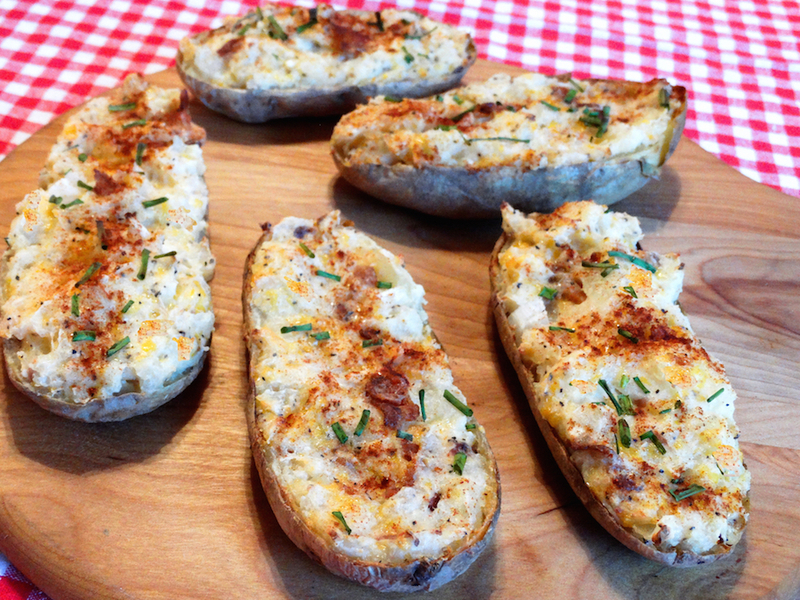 Bill and I are satisfied with boiled potatoes or baked potatoes, with a dab of butter, and salt and pepper, but when it’s time to splurge, this is one of my go to potato recipes: twice-baked potatoes packed with sour cream, Parmesan cheese, onion, horseradish, cheddar cheese, a little butter, salt and pepper, and bacon, topped with chopped chives. Plus, these potatoes can be prepared ahead of time, and refrigerated until time to reheat for your serving. They’re great to make ahead and freeze for when unexpected company drops in also. Truthfully, I could make a meal of just these delicious spuds, a perfect little meal of comfort food! Scrub and pierce potatoes, bake for 1 hour, or until fully cooked. Cut potatoes in half and scoop out potato, place in a large bowl, being careful, so as not to tear the skins. Add butter, salt and pepper to potatoes, mash until smooth. Add sour cream and mash again. Add horseradish, onion, Parmesan and bacon, stirring well. Stir in 1 tablespoon milk. It you like it creamier, add more milk, one tablespoon at a time, until desired consistency. Add more salt and pepper, if needed. Fill empty skins with potato mixture. Divide cheddar cheese every among potatoes. Garnish with a sprinkling of chives and paprika. Return to oven and reheat until hot. Or refrigerate them to reheat later before mealtime. Our Italian butcher, here in town, makes the best Chicken Dijon ever. It’s the shops’ biggest seller, and for good reason ~ it is delicious, and the smell of garlic as it’s baking is over the top with aroma! It is delicious, much better than it looks! Richie won’t share the recipe ~ this is how close I came to it. I realized too late, I should’ve lightly pounded the chicken to flatten or cut it in half horizontally. This turned out close to the shops’, but there are some spices missing that I haven’t figured out yet. And he probably adds more garlic. Meanwhile, this was very good, Bill and I were happy with it! Butter a baking sheet or rack. Mix oil, mustard thyme, salt and pepper in a small bowl. 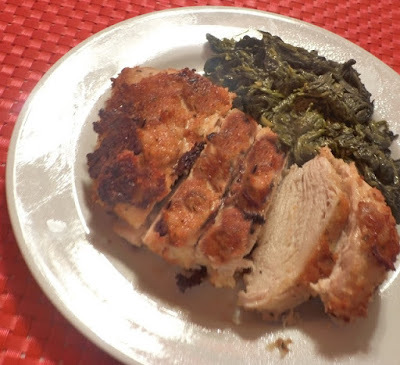 Add chicken breasts and coat both sides, set aside on a plate. In a shallow bowl, combine panko, Parmesan and garlic powder. Dredge chicken in Parmesan mixture, coating heavily, patting it into the meat. Place chicken on prepared rack set over a baking sheet. Bake until chicken is golden and cooked through, about 20 minutes, depending upon how thick chicken is. Whatever you call it, it’s an “oldie, but goodie” for all you chocoholics out there, that’s known to us as Chocolate Lush. Great flavors mingle together in your mouth with every decadent bite. Be adventurous and make it with your favorite pudding. I think lemon is great, but the chocolate version rules here. The pecan crust is what makes it special. It goes with any flavor pudding, and contains no sugar, making it a perfect balance for the sweet layers topping it. Spread over the crust is a smooth layer of powdered sugar, cream cheese, and Cool Whip. Topping that is the layer of cream chocolate pudding, then more Cool Whip is spread over the pudding. Finally, scatter a few chopped nuts for the finish. Ooooohhhhh, it’s a heavenly thing ~ maybe it should be called Heavenly Lush! And, perfect for a Labor Day holiday dessert! Mix all 3 ingredients, spread in 13” x 9” pan. Using electric mixer, blend cream cheese, vanilla, sugar, and 1 cup Cool Whip. Place in refrigerator and let set 1 hour or overnight. Beat until dissolved and spread over second layer. Scatter ½ cup chopped pecans over all for garnish.